"Curry and raisins add a spicy and sweet element to this sweet and savory carrot apple salad with a fresh bite from parsley." 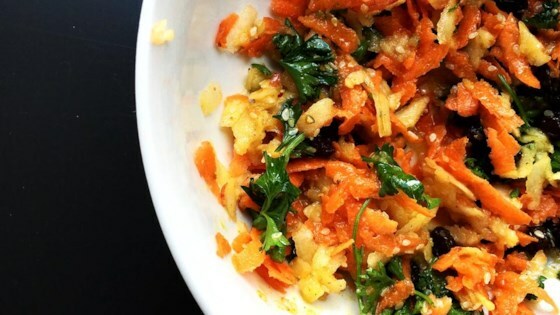 Combine apple, carrots, raisins, and parsley in a bowl. Mix lemon juice, olive oil, sesame seeds, curry powder, maple syrup, salt, and pepper in a jar or container with a tight-fitting lid. Cover jar and shake until dressing is a uniform yellow color. Pour dressing over salad and mix until evenly coated. Make a healthy green salad loaded with fresh fruit and curried nuts. This was so simple to make and so tasty. I found the grated apple a little moist so I just julienned. This will definitely be a regular in our house. Absolutely delicious. Try it and see. loved it! had extra time to cut up everything like matchsticks. Otherwise followed the recipe exactly. This is easy to make and tastes great.